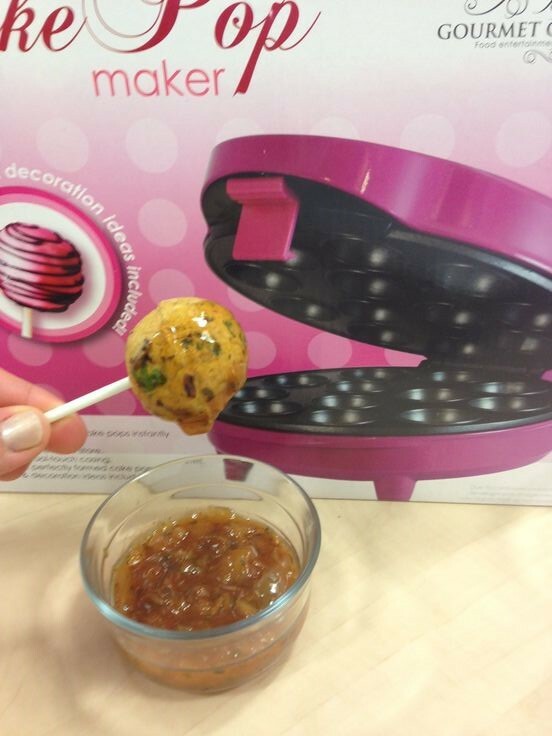 For use with the Gourmet Gadgetry Cake Pop Maker of Retro 3 in 1 Sweet Snack Maker. 1. Turn on your machine and allow it to pre-heat while you make the mixture. 2. Put the onion, potato, ginger, chili's, coriander, salt and baking powder in a large bowl and mix thoroughly. 3. Mix in the gram flour one spoon at a time until the mixture starts to come together, the moisture from the fresh ingredients should start to bind the mixture. 4. Add the oil one spoon at a time whilst mixing. 5. Check the seasoning according to taste i.e. salt, chili's etc. 6. If the mixture has not bound sufficiently then add a couple of teaspoon of water. 7. Leave the mixture to stand for 15-30 minutes. 8. This mixture can be prepared as early as you like and left in the fridge until ready. Just remember to take it out 30-60 minutes before use. 9. Spray the baking plates with a little oil and add a spoonful of mixture to each cavity. 10. Close the machine and allow to bake for 5-6 minutes before checking to see if you Onion Bhaji Pops. If they are still a little uncooked close the lid and allow to cook for a further 2 minutes. 11. Once they have finished cooking remove from the machine and allow to sit for a minuted before serving with chutney!